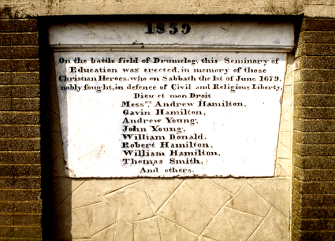 A mural memorial was erecte din 1839 within the wall of Drumclog School. The building is now a private house, but the memorial remains and can be visited. The Battle of Drumclog took place on 1 June 1679 between the Covenanters and the troops under John Graham of Claverhouse. The battle followed a conventicle led by Rev Thomas Douglas. Around 250 Covenanters faced 150 soldiers, the former defeating the dragoons. SIx Covenanters were killed, and gravestones to them can be seen in nearby churchyards - Newmilns, Loudoun Kirk, Strathaven, Stonehouse and Lesmahagow. Nearby is the main Drumclog Battle Memorial.